Lucas is such an outdoors boy and I feel bad that this Autumn we haven’t been able to get out as much as we did last year. Now I’m nearly 7 months pregnant I can’t walk quite as far, I can’t catch up to him quite as quickly and I can’t follow him round all the playground equipment. At the weekends I take advantage of having my husband at home and we try to get out for a couple of walks, at least he can chase after Lucas while I slowly amble after them. 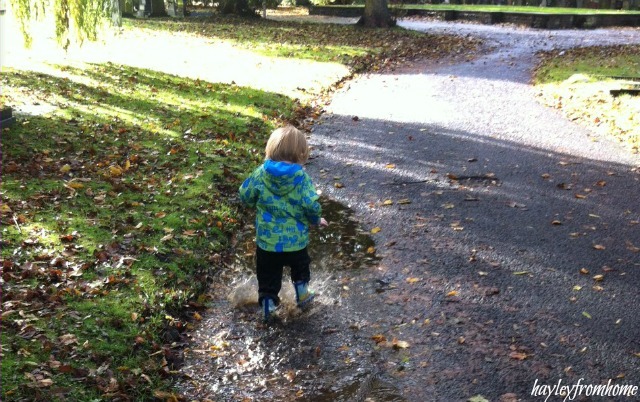 Last year, one of my favourite memories with Lucas was when we went puddle jumping. 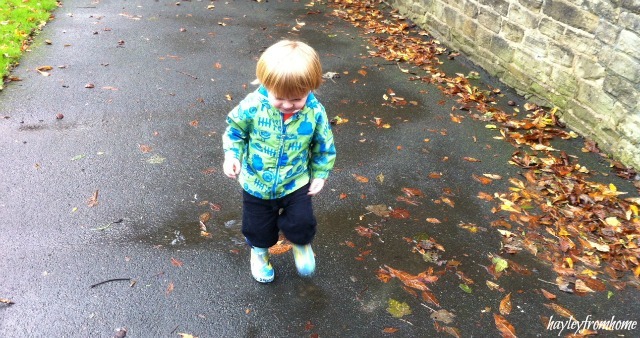 He had been walking for a few months I was more confident to let him loose; we went out prepared for the wet weather and spent the most perfect morning splashing in puddles. I have a couple of videos of him discovering the water that still make me giggle. He still looks out for puddles on our walks now so as we headed off for a short stroll last weekend he got out his wellington boots and we purposefully hunted out some puddles for him to have fun in. So much has changed in a year but he is still the same smiling little boy who chuckles everytime he sploshes through a puddle! Lovely photos Hayley! I spy my favourite Sunday walking spot. 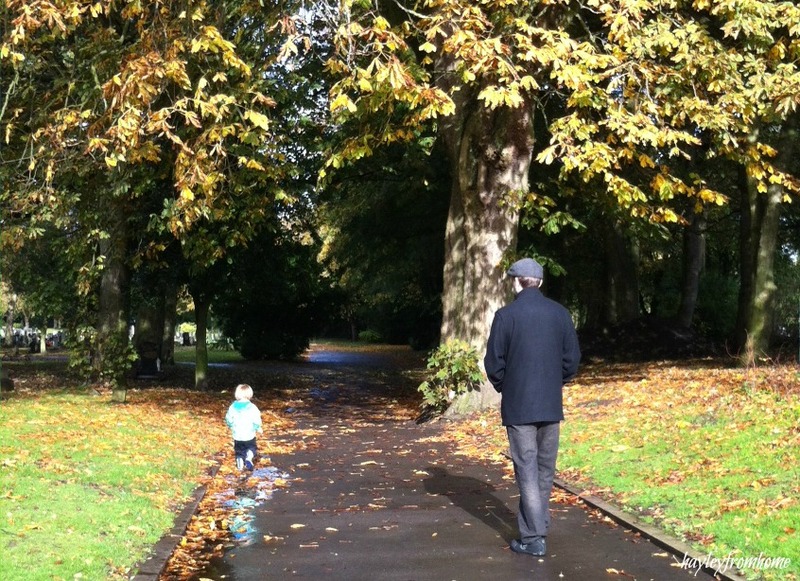 Its so cute that Lucas loves being outdoors & that you & James take the time to be outside with him. 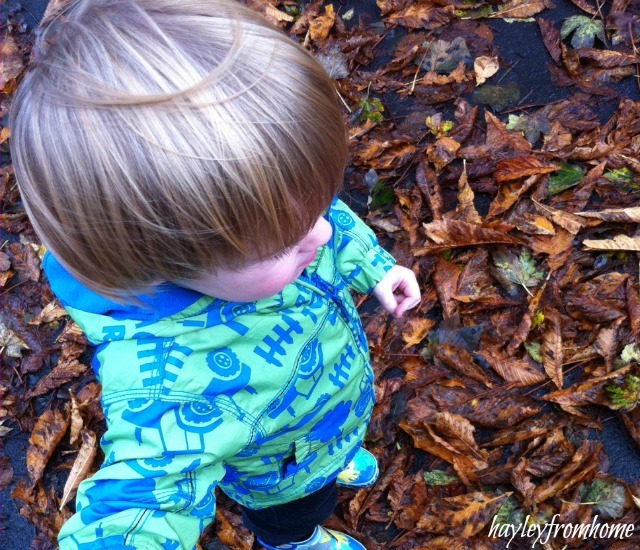 We have some lovely areas to explore near us & I am sure as the twins get older Lucas will be showing them all his favourite spots to jump in puddles! Can you imagine with three of them loose?! I hope we can carry on getting out for walks though, doesn’t it look amazing up there in Autumn?! Splashing in puddles is such a fab childhood activity that always brings a lot of enjoyment – isn’t this what wellies were made for? It looks like you had a lovely bright day for your walk in such a lovely park. Thanks for linking up and sharing with Country Kids. 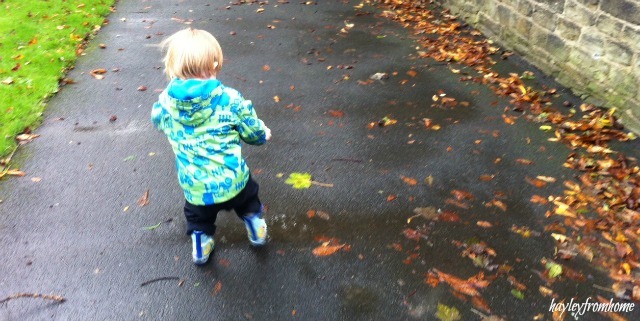 He loves splashing in puddles but I fear I may have encouraged him too much as he does it in his canvas trainers too! All good fun though. I think puddle jumping is fun for a long time to come!